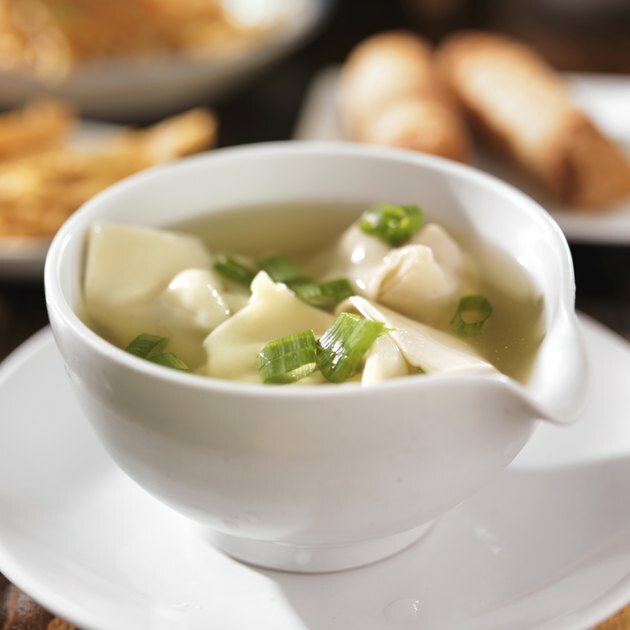 Starting off your meal with a broth-based soup, such as egg drop or wonton soup, can help you fill up with fewer calories since they are low in energy density, or calories per gram. This means you'll be less likely to indulge in large amounts of the high-calorie appetizers and entrees typically available in Chinese restaurants. Both egg drop and wonton soups are among the better options if you are trying to eat healthy at a Chinese restaurant. A cup of egg drop soup contains 65 calories and only 1.5 grams of fat, while a cup of wonton soup provides 71 calories but only 0.6 gram of fat. The lower-calorie egg drop soup will also give you 26 percent of the daily value for vitamin C. Unfortunately, both of these soups are high in sodium, with egg drop soup containing 37 percent of the DV and wonton soup containing 38 percent of the DV for this mineral. Regularly consuming too much sodium can lead to high blood pressure and an increased risk for heart disease, so watch your sodium intake the rest of the day if you consume either of these soups. Does Whole-Wheat Pasta Contain Eggs?